Private spacecraft inches towards space station. May 25, 2012 - Launched May 22, 2012 early Tuesday morning (EST) from Florida's Cape Canaveral, SpaceX's Falcon 9 rocket successfully put into orbit its Dragon spacecraft. Designed and built almost entirely in-house, the recent Falcon 9 launch represents the first ever private company to develop, build, and launch a mission to the International Space Station (ISS). 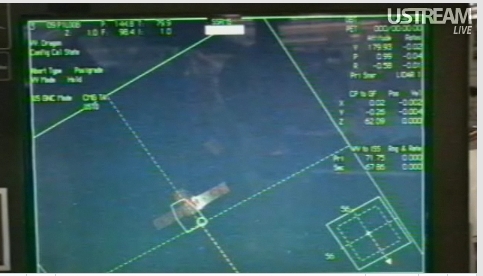 Images: (Top) The Dragon spacecraft as viewed from the International Space Station. (Bottom) SpaceX mission control. Watch live coverage here on NASA TV, and alternatively, watch live feed from the Space Station itself here. SpaceX's historic mission represents a shifting paradigm away from monolithic corporations incestuously entangled and influencing government, to smaller, more capable companies leveraging innovation and modern manufacturing technology while pushing forward the frontiers of human progress. Eventually, engineers, scientists, and technicians from NASA as well as large government contractors, through companies like SpaceX, may find a better avenue by which to employ their talents, or be encouraged to start smaller firms truly dedicated to spaceflight and human expansion amongst the stars. By getting informed and involved in the coming paradigm shift, average people can ensure it is steered toward the best interests of all people and true progress, instead of once again being commandeered and stifled by special interests and monopolists.